My wok is one of my favorite kitchen utensils. Because I love stir fries. Because any combination of veggies and/or meat/fish can be put in. Because they are done in no time. Especially now in summer I don't want to watch over slowly cooking pots for ages, not to speak of standing in the heat they radiate. And as much as I love my raw salads, there is a limit to it. Sometimes it just has to be cooked. Fast, light, healthy, vegetarian, or vegan. 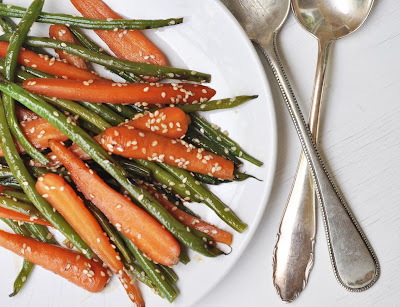 This sesame carrots and green beans stir fry has been in my head for quite some time before I actually cooked it for the first time. I wanted it with an Asian flavor to it that tastes well hot and cold. The leftovers are a perfect cold salad with that dressing. It serves very well as a side dish to grilled fish or poultry. I often like to eat it in double or triple portions without anything else, just a huge portion of veggies. Just the right thing for hot summer lunches. Toast the sesame seeds in a dry pan over medium heat for about 5-7 minutes. Set aside. Steam carrots and beans for 2-3 minutes. Drain and rinse under cold water. In a small bowl, combine vinegar, soy sauce, honey, salt, pepper with 1/2 tablespoon of sesame oil. Put a wok on very high heat. Once it's hot, add 1 tablespoon of sesame oil. Stir in the beans and carrots and stir-fry for about 1 minute. Add the seasoning mixture and stir-fry for another 1 minute. Take off the heat. Stir in the toasted sesame seeds. Transfer to serving dish. Serve immediately.